Back in high school I used to spend all sorts of money at the salon. Spa pedicures ($20), Pink & White Acrylics ($35) and then I’d need to get them filled every other week ($20). Maybe that helps to explain the debt I’m still struggling to pay off today! For the past couple of years I’d go once in a while or do my own nails, but I wouldn’t regularly keep up with them at all. But as of late I’ve been painting them myself at home on a regular basis. I like to keep them relatively nice, it makes me feel more feminine. This morning. Excuse under eye bags. Love this color! And my mug. 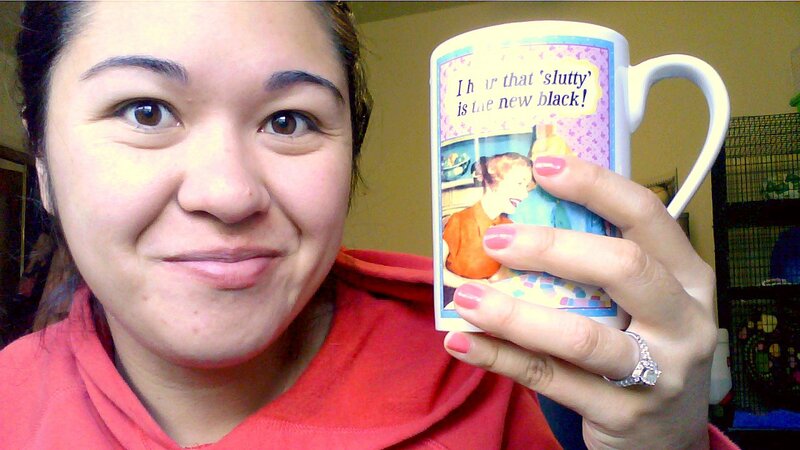 Slutty is the new black in case you didn’t know. I recently a post over on The Dainty Squid about Sally Hansen Nail Strips and now I really want to try them. I’m really cheap and they’re about $10 a pop for 16 strips. Not quite enough for 2 full applications, but maybe a full application and then another application with a few coordinated painted nails. So lets say that’s $5 per “manicure” which still beats the nail salon, but it still way more expensive than nail polishing at home. If I can find a sale on them (see? I told you I was cheap) then I might buy a few and give them a try. There are some super cute patterns! thanks for your comment!! Toms are SO comfy you must get a pair 🙂 I am following you on Google, I hope you’ll follow me as well!